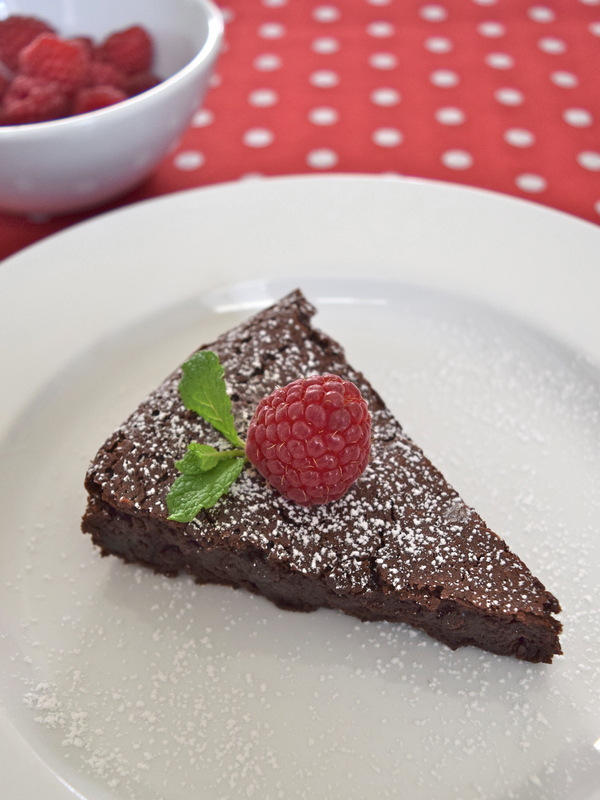 Many years ago, I made a fabulous flourless chocolate cake, but I couldn’t recall the food magazine source. The cake was so good that my husband, who is very finicky, still remembered that wonderful chocolaty dessert! I searched the internet, found and adapted the recipe from the Epicurious website, which gave credit to Gourmet, November 1997. This is cake is truly a chocolate lover’s dream! Though it is not a healthy dessert, but it is so simple to make and will be served this Christmas Eve! Line the bottom of an 8-inch nonstick round cake pan with waxed paper. Grease paper and pan sides with butter. In medium bowl, place chopped up pieces of chocolate in microwave oven and melt the chocolate. Add butter and whisk until smooth. (You may have to put the bowl back in the microwave for a couple of seconds). Make sure you whisk well. Slowly add the eggs and whisk as you go along. Sift in the cocoa powder and whisk until combined. Pour batter into pan. Bake in the middle of oven for about 24 minutes or until the top forms a thin crust. Let cake cool on a rack for 5 minutes. With a small spatula or butter knife, carefully trace around cake pan. Invert cake onto a serving plate. I’m topping it with condensed milk? I don’t use condensed milk much, but I think it would be yummy! I am going to be really unhealthy and serve with vanilla bean ice cream on Christmas Eve! Thank you. I also use it to dip strawberries.